My biggest question about Dave Aranda at LSU was whether an approach that worked with Wisconsin’s versatile farm boys was the best way to unlock the pipeline of NFL talent that flows through Baton Rouge every year. I guess we don’t actually know yet to what extent Aranda’s full blown defensive playbook will look like with LSU talent but we do know that Dave Aranda works with LSU’s NFL players because the Tigers were very good last season. I explain a bit of how he modified his approach for the Tigers last year and how his cousin from the Gary Andersen coaching tree, Todd Orlando, might be mimicking that style in Austin in this (FREE) piece at Inside Texas. An interesting topic here that I’d like to explore further (which as much assistance as you lot can give me) is to analyze the roots of this coaching tree. To count as a part of this tree a coach ideally builds his defense around zone blitzing and uses the “rover, mac” language that I believe traces ultimately to Kyle Whittingham at Utah. Behold! 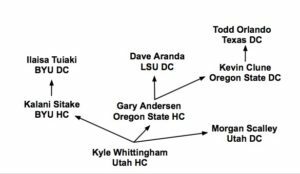 I’m jokingly referring to this as the Mormon Mafia coaching tree. Kyle Whittingham got started at Idaho State and eventually got the job at Utah, replacing his father as DC. When Urban Meyer took over the Utes he kept Whittingham around as DC and when Urban Meyer left for Florida Whittingham was offered both the BYU and Utah jobs. He decided to roll with the public university in the state over his alma mater but now obviously one of his pupils has taken that job as well. If you want a glimpse of how the original version of this D works you can just turn on Utah any given Saturday because they’re still running it with Whittingham providing the guiding vision and Morgan Scalley now in charge of implementing and tweaking it from season to season. The Kalani Sitake branch has tended towards man coverage in addition to initiating an Islander branch of the tree but in year one at BYU they had to play more quarters due to a lack of man-capable cornerbacks. Dave Aranda prefers to play quarters when he can and so does Todd Orlando. Andersen appears all over the tree and as a Christian with a dad that was an LDS member, he ironically breaks the chain of Mormons within the tree although it picks back up again with Kevin Clune. Andersen is also the starting point for the branch of coaches that like to use the 3-4 front rather than the four down approach of Whittingham. Everyone on this tree has held a job at either Utah, Utah State, or BYU and many of them played at BYU back in the day. All of them have excellent resumes built off their ability to use zone blitz schemes to generate a tremendous pass rush. Utah is secretly a beautiful place, if you’ve never been. I drove up through the state once for a conference near Provo and was shocked by all the amazing landscapes. It’s also secretly providing the roots of some of the best defensive schematics and coaches in the college game today.